BBC Northern Ireland has secured a new four-season deal to provide live coverage of Ulster's matches in the Guinness Pro12. In the league section of the competition, BBC TWO NI will broadcast Ulster home and away games which are not being shown live on Sky Sports. The matches that Sky select will be live on BBC Radio Ulster. BBC Northern Ireland has also secured live TV coverage of any play-off match involving Ulster - including finals. Matches being broadcast live on BBC NI Television and radio will also be streamed online with video highlights of all matches also going up on the BBC Sport NI website. Sky Sports are new partner broadcasters - along with BBC Wales, S4C, BBC Alba, BBC Scotland, TG4, with discussions for an Italian broadcaster ongoing. BBC Northern Ireland's Director Peter Johnston said that he was "delighted" that the corporation had secured a new Pro12 deal. "Live Friday night Ulster rugby has proven to be very popular with a wider viewing audience at home, with the games regularly being amongst the most watched programmes on BBC Two in Northern Ireland," added the BBC NI Director. 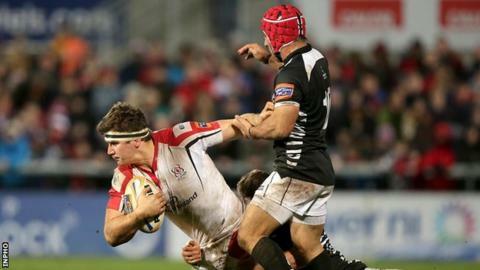 BBC Sport NI's Editor Shane Glynn added:"It's the beginning of a new era for Ulster - with a new coach and a group of new and exciting signings to replace some of the experienced players who retired or moved on at the end of last season. "It's shaping up to be a fascinating season and we'll bring audiences live coverage of every match, on TV or radio." Guinness Pro12 Chief Executive John Feehan said that the competition would be renewing "our ongoing and very successful relationship with BBC Northern Ireland". "They have significantly contributed to a huge increase in the popularity of rugby in Northern Ireland with first class coverage of the Ulster games over the last number of seasons," added Mr Feehan. Ulster Rugby Chief Executive Shane Logan paid tribute to BBC Sport Northern Ireland's continuing coverage of the sport. "There is now more interest in rugby in Ulster than ever before and that is thanks in many ways to the excellent coverage that BBC Sport NI has given the sport in recent years," added the Ulster Rugby chief. "The large viewing figures reflect the excitement that Pro12 rugby generates but are also testament to the comprehensive and insightful coverage that the BBC Sport NI team provide." Stephen Watson will present the BBC Sport NI's Pro12 television coverage with Nikki Gregg anchoring Radio Ulster's Pro12 broadcasts. With Jim Neilly in the commentary box, expert analysis and co-commentary will come from a range of ex-players, including Ryan Constable, Bryn Cunningham, Andy Ward, Tony McWhirter and Maurice Field. Ulster's opening match of the season away to the Scarlets will be broadcast on BBC Radio Ulster on Saturday 6 September with the home game against Zebre on Friday 12 September on BBC TWO Northern Ireland.